A PROVEN PROCESS for developing a powerful new mindset to finally achieve your financial, personal and professional goals-in 90 days or LESS! My 90-day transformational program that provides you with the clarity and confidence you need to dissolve self-imposed limitations and become an unequivocal powerhouse in the pursuit of your biggest, most important dreams. I know how life is. It’s constantly throwing you curveballs, thwarting your best efforts, giving you new and unanticipated challenges. You work hard at everything you do, pouring your time, sweat, and effort into it. Still, you always seem to fall just short of what you really want to accomplish. You set goals, and you believe you’re taking action to achieve some of them. Unfortunately, you’ve yet to check off a single goal from this year — something always seems to get in the way. Financially, you struggle to get out from under mountains of debt, yet you continue to make choices that put you further under. You put off making decisions or taking action, even on small things—because you’re afraid of moving in the wrong direction (so right now, you’re going nowhere!). Your personal and professional relationships definitely show room for improvement — conversations constantly leave you feeling “rubbed the wrong way,” and you realize you’re the common denominator (but aren’t sure how to fix it). What if I told you I could share with you an all-encompassing system for achieving EVERY goal, and for transforming your ENTIRE life? If you want it, you’re in the right place. So many of us grow up with a mindset built around limitations rather than possibilities, and therefore, we become stagnant when we run up against the inevitable roadblocks and obstacles life presents. You MUST realize and harness your potential. You MUST learn to set your goals effectively, and program your mind to achieve them, automatically. These 2 things may sound simple, but let’s face it: if you’d done them, you wouldn’t be reading this letter right now. 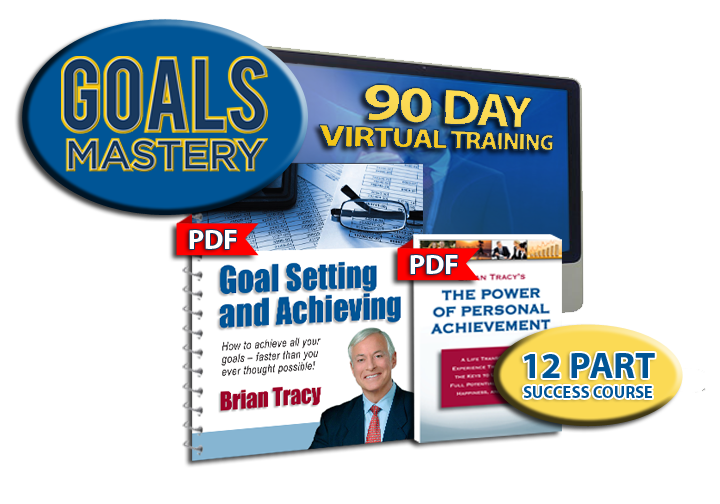 I’m Brian Tracy, and it’s my mission to help you transform your life and achieve all your goals — faster than ever. You probably know I’m the owner of a multi-million dollar, international company that educates people just like you on personal and professional success. I’m the best-selling author of more than 50 books in dozens of languages and countries, and I’ve sold millions of copies of my teaching programs. I didn’t start off on the road to million-dollar status. But I’m about to reveal 2 of the most powerful systems that got me here. My high school issued me a “leaving certificate” rather than a diploma. I worked various manual labor jobs until I landed my first job in sales in my early 20s. I also learned that success leaves tracks. If you follow in the footsteps of other successful people who have come before you, you, too, achieve success. And now, I’m going to share MY tracks with you — the 2 most important success systems I know and use, every day. By Tad Purtill "Director – Superior Speeches"
This is where you lay the foundation for achieving absolutely everything you want to in life. Success begins with your deciding exactly who you are and what you want, and then writing it down – and finally, creating a detailed plan for accomplishing these ideals. You may not know it, but the more you think about your goals, the more your subconscious works on them, bringing you fresh insights, innovative ideas, and creative solutions. Your confidence increases, your self-esteem skyrockets, and your productivity as you move towards your goals intensifies. Are you ready to become unstoppable? Inside of you, you have more potential than you could use in 100 lifetimes. To get the most out of it, you must become a leader. Leaders are made, not born. You become a leader by thinking the thoughts leaders think, and then by doing the things leaders do. Why is leadership important when it comes to reaching your goals? Because it takes strength, character, and a positive attitude to define what’s most important to you, and then to take action to get it. Master the relationship between your conscious mind and your subconscious mind to get better results than ever. Learn what it takes to find out what you were put on this earth to do — and develop the strength and tenacity to do it. When you align your values, beliefs and ideals with your vocation, occupation or profession, you discover what you’re meant to do with your life. When you discover it — and do it — your success comes effortlessly, thanks to a natural facility. This is where your future lies. Find it, define it, and experience it as you take charge of your life and become the architect of your destiny. Meanwhile, discover how to change your thinking and change your life: free yourself from negative emotions, stress, worry and subconscious blocks forever so you can move continuously forward. Your job is to find your “heart’s desire,” and to then take action to achieve it. When you do, you’ll be astonished at how much ground you cover. The first step is to take complete control of your suggestive environment by putting your mind on a healthy mental diet. The result: you shape and develop your personality and temperament, and therefore your behaviors, and finally your levels of achievement. Put to use my working, proven system and you’ll have everything you need to follow my steps to ultra-success. Programming your brain this way is as simple as programming a computer. You may not realize that your subconscious mind (which has a tremendous impact on your achievements) can’t tell the difference between the things you say, think, visualize and feel, and your external reality. So why not feed your subconscious mind everything it needs to transform your deepest desires into reality? You learn and master my 7 step goal setting process so success becomes automatic. Once you’ve learned to set your mind up for automatic success, you can take it one step further: use these advanced programming techniques every single day for accelerated success. This is where you put into action the theories you learned in the previous section. Plus, I share some of my most powerful time management strategies so you power through your most important tasks without looking back as you take action to achieve your most important goals. Buckle up … it’s time to get moving! Your superconscious mind is the most powerful source for success, achievement and happiness that exists in your personal universe. When you learn how to use your superconscious mind confidently and consistently, you find there is no obstacle you cannot overcome, no problem you cannot solve, and no goal you cannot achieve during your lifetime. And of course, you must not underestimate the importance of your physical health when it comes to supplying your mind with the sustenance it needs to do its best work. Stay healthy, physically and mentally, and you become unstoppable. You may not be aware of it, but the words you use to describe what is happening to you, and the way it makes you feel, determine the quality and tone of your life. The most powerful influence on your attitude and personality is what you say to yourself and what you believe. So how do you maintain a positive attitude? You learn to manage your responses to the inevitable ups and downs of daily life. No one escapes things “going wrong,” but your reactions to these things determines how well you perform, how happy you are, and how satisfied you feel. 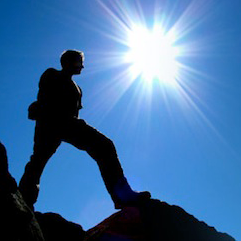 Every high achiever has encountered adversity on his or her path to ultra-success. So will you. You have a choice: you can use the adversity to become healthier, more vital, and more successful, or you can let it make you depressed, negative, and angry. The great thing is, it’s just that: a choice. In the moment, it may not seem so simple, but here you learn how to create within yourself a positive response to stress and adversity so you always see the lesson and use it to move forward. Your ability to enter into a long-term, loving relationship is an important measure of your character and personality. Your committed relationship with another human being has the potential to achieve the balance and harmony nature demands. Similarly, your ability to interact well with others in your personal and professional life determines how much success you achieve. Learn to become a positive person who is well-liked, trusted and well-respected, and people will gather around you to bolster you straight to the success you desire. 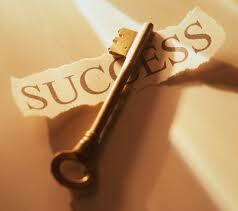 Want to guarantee your success? Then you MUST hone and develop the single quality of self-discipline. All great success in life is preceded by long, sustained periods of focused effort on a single goal, with the determination to stay with it until it is complete. Here we cover 2 different elements of self-discipline you must master if you hope to succeed, based on what you define as your true purpose. When you master the 4 remaining areas of self-discipline we discuss during this lesson, you harness your personal power and begin gaining momentum in the hot pursuit of your biggest, most important goals. This is where you learn exactly what to do to move ahead in your life more rapidly than the other people around you, and more rapidly than you have before — so you become one of the highest achievers in society. The common characteristic of the most successful men and women. If you don’t have it, you’ll never achieve the success you desire. Why it’s essential to understand and improve the 3 parts of your personality if you want to move forward. How to FINALLY dissolve your problems and difficulties by understanding and living in harmony with The 7 Mental Laws. A common misconception about the Law of Attraction, and why, if you think about what you want, you’re unlikely to get it (plus, how to ensure you actually get what you want!). One change you can make in your attitude that can exponentially increase the results you achieve. Where negative thought patterns begin — and how to change them so you can move past your fear of failure and fear of rejection and begin taking risks that pay off. Why, if you don’t recognize the relationship between your subconscious mind and your conscious mind, you’re likely to keep repeating the same behavior patterns over and over — and getting the same results. 4 different types of work and how to choose the one that will give you a wonderful life. The SINGLE question you can ask yourself in any situation to ensure you’re constantly moving forward. Exactly how to TURBOCHARGE your learning abilities so you pick up more, faster, and retain it long-term. To STOP working so hard to achieve your goals — and to START achieving them AUTOMATICALLY. What you can do to ensure the most powerful part of your mind is working on your goals 24/7, and solving your problems for you (even when those solutions look to you like obstacles or setbacks). Exactly what to say to yourself so you maintain a positive outlook — and reap positive results. What the ability to maintain a healthy long-term relationship says about your character and your ability to succeed. A proven method for managing your daily tasks so you always get the most important items done, first. The biggest single mistake parents make in parenting their children — how to avoid it, and what to do if you’ve already made it. A hallmark of the highest performing, highest paid, most successful people in our society, and the 5 questions you can continually ask yourself to keep focused on achieving the results you want. The Number One reason for failure in life. …you learn absolutely everything you need to know to decide who you are, what you want, and to then follow a proven system for getting it, step by step, no matter what happens in your life. Your self-esteem, self-respect and personal pride increase and you experience what it’s like to be unstoppable. First of all, you should know I want you to experience the same level of success and personal fulfillment I have. As I mentioned before, success leaves tracks — and when you follow them, you can achieve it, too. I am totally committed to helping you do that. Consider me your personal guide on the journey to success. To that end, here’s how we’re going to do this, together. We’ll release the videos over the duration of the 90-day course, and you can watch them at any time. Now you’re probably wondering how much this is going to cost you. First of all, you couldn’t ask for a better return on your investment. How much is it worth to you to experience a complete life transformation? How much is it worth to you to go from stuck in mediocrity to accelerating toward ultra-success, without looking back? How much is it worth to become unstoppable in the pursuit of everything that’s important to you? Tens of thousands of dollars? Thousands? For just $497 $297, I’m giving you absolutely everything you need to live the life of your dreams. Remember, I’ve researched success — and what creates it — for the past 40 years. Let me guide you on your journey to ultra-success so you can shave years off your learning curve and avoid the common mistakes and missteps that keep people stuck, their dreams and goals always just out of reach. To me, this seems like a no-brainer. 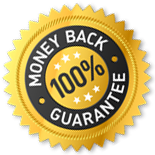 But just in case it isn’t, you should know your investment is covered by my 100% Satisfaction Guarantee. If for some reason, or any reason, you don’t believe “Goals Mastery for Personal and Financial Achievement Program” lives up to your expectations or is worth the investment, just let us know before the beginning of week three’s training module begins, for a no-questions-asked, prompt and courteous 100% refund. This program is no longer refundable once the third virtual training session has been viewed. No weasel clauses or hidden meanings here. If you're not happy then neither are we. My friendly staff will cheerfully return your money and we'll still be friends. That’s it. More importantly, you get a complete life transformation. Isn’t it time you took control of your life and made it what you want it to be? 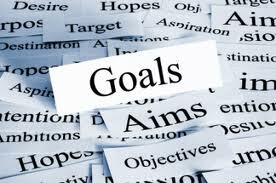 I’d love to get your “Goals Mastery for Personal and Financial Achievement” Course. I mentioned this before: only 3% of adults have written goals. Are you among them? This small minority earns 10 times as much as those people who don’t have written goals. This powerful course teaches you exactly how to choose your goals, and how to pursue them effectively. Within you lies the potential to achieve each and every dream you envision — so why wouldn’t you learn from an expert precisely how to unleash that potential? P.S. This could be the moment that changes your life … take action now to rise above mediocrity forever, and embrace all-out success. It’s yours, starting now!